Room was large with rooms downstairs and kitchen and lounge upstairs. Lounge and kitchen were massive and we had plenty of room as a group of 4 friends. Room was reasonably clean. Bed was comfortable and sheets seemed clean. I liked that the location was somewhat close to the tube because there is not much going on in that area of town. Although I had no use for it, it was nice that there was a full kitchen for use if need be. There is also sufficient room for two people. That said it was a will fitted, modern apartment in a decent neighborhood with amenities and shops within reach. Also easy access to public transport. All staff are so nice. I spent 2 nights at this apartment and all the staff are very welcome, smiling and recommend places to go or to eat nicely. The bedroom is nice and quite. Bed is good. View of city, street and ;location is on the main road so its make it easy for you to take Uber or Cab. location are very bad and value for money are very bad, it is expensive while it is allocated in the bad area unlike what they said on their offers on the booking.com & other sites. the apartment is dirty and the cleaning is very poor & No auditing or a recognize standards. We were a little concerned about the location, but in the end it was good. Easy access to the tube and relatively quick to most of the big sights. Good access to groceries and restaurants and no real safety concerns. It's not as refined as the West side of London but there's still a lot to do. The apartment itself was quite spacious (for a major city). Everything was clean and worked well. We had 4 people including two teenagers and a 2BR was just right. All was fine.Would stay again.Helpful friendly night staff. Lock in a great price for Marlin Aldgate Tower Bridge – rated 8.2 by recent guests! 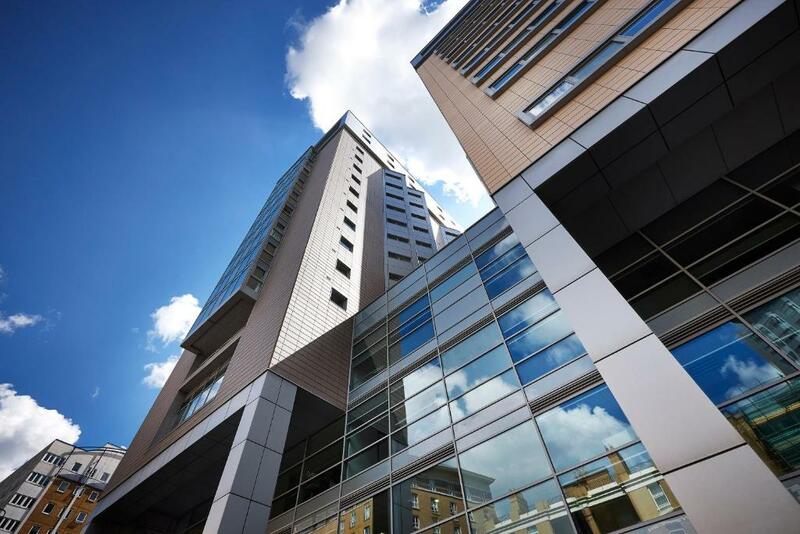 Marlin Aldgate Tower Bridge This rating is a reflection of how the property compares to the industry standard when it comes to price, facilities and services available. It's based on a self-evaluation by the property. Use this rating to help choose your stay! One of our top picks in London.These luxurious apartments are set within London's financial and fashion districts, a 5-minute walk from Aldgate East Underground Station. The apartments with kitchen facilities are just a short walk from the famous Brick Lane and one of London's most notable attractions, Tower Bridge. Free Wi-Fi is available throughout. Each apartment comes complete with a modern living area and kitchen, including an oven and stove, dishwasher and kitchen utensils. The stylish living space has hardwood floors, a flat-screen TV, and luxury furniture. Modern high specification bathrooms in each apartment feature L'Occitane toiletries. Aldgate has historic cobblestone courtyards and a wide range of restaurants and bars within walking distance of the property. With a weekly maid service and linens change, there is also a 24-hour emergency contact available. Free Wi-Fi is available throughout and you can upgrade to enjoy super-fast 100MB broadband. When would you like to stay at Marlin Aldgate Tower Bridge? Full kitchen, spacious living area and bedroom with private bathroom. Free toiletries and free Wi-Fi. A double sofa bed can be set up for an additional GBP 54 per night. Full kitchen, spacious living area, 2 bedrooms (1 private bathroom). Free toiletries and free Wi-Fi. Spacious apartment with striking city views. Full kitchen, spacious living area and free Wi-Fi. Some apartments feature a balcony. A twin bed configuration is available on request at an extra GBP 30. Features include weekly linen change, luxury L'Occitane toiletries, views of the city and late check-out until 12 pm. A twin bed configuration is available upon request at an extra GBP 30. Studio apartment including a private bathroom, free Wi-Fi, DVD player, LCD flat-screen TV and hairdryer. A full kitchen is provided which includes a washing machine, dishwasher, microwave and tea/coffee making facilities. House Rules Marlin Aldgate Tower Bridge takes special requests – add in the next step! A GBP200 damage deposit is required on arrival (around USD258.77). This deposit will be fully refunded 7 days after check-out, as long as there isn't any damage to the property. Marlin Aldgate Tower Bridge accepts these cards and reserves the right to temporarily hold an amount prior to arrival. A damage deposit of GBP 200 is required on arrival. That's about 258.77USD. This will be collected by credit card. You should be reimbursed within 7 days of check-out. Your deposit will be refunded in full by credit card, subject to an inspection of the property. Great location very spacious apartment and near to local transport. No Gym facilities onsite, limited access to Sky channels. Clean, Balcony room, Walking distance to the city area , close access to coffee shops grocery shopping and dry cleaners. for what it was there was nothing to dislike about it although having to pay £30 for a midday check out was a bit steep. Location was great as was the size of the apartment. Great value for money considering the location. 2nd pack of coffee since staying 2 nights would have been good. Pillows could be comfier. Nothing major. really clean, spacious rooms, bed was comfy. staff were fab. Location so near the tube was perfect for my meetings views were great. Apartment was very spacious, clean and comfy! Floors were badly marked in the living room. Window blind didn’t work in the dining area. Having booked a penthouse apartment, I expected to have a balcony. The noise from the boy racers, police cars and ambulances - known as the “Whitechapel Anthem” - sound proofing was awful. Didn’t have a single unbroken nights sleep for 4 nights. Usually waking up 4-5 times a night. Because I was getting up in the night I noticed that the room gets colder overnight. Shower was very poor - water pressure and scaling to shower head. Facilities and furnishing - comfort.